My drum is full of memories. Memories not merely of smoke tanned buckskin, sweet grass, sage and cedar, but memories of all beautiful things of the woods and people. My drum is full of mystery, full of voices. These voices ~ they speak always of Olden Times, yet in the same breath, they speak of youth and more youth to come. They tell of children in all the tomorrows; Radiant, Joyous, Dancing. Yet they seem to say, (these drum voices) that these same children must know the simple life, the romantic life of the wood, for men will live the modern life better if as children, the came to know the Ancient Way. My drum is a Medicine Drum. 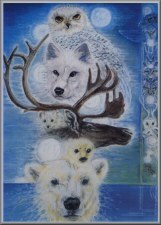 It has a mysterious potency ~ A Spirit Power ~ within the drum. If you are sad, you will find solace with this drum. If you are afraid you will find courage with this drum. If you are angry, it will bring relief and contentment. The Medicine of my drum is the medicine of dancing, of play, of joy, of art, of philosophy, of religion, of LIFE!! To the Indian, theses things are all integrated. They are really all one. 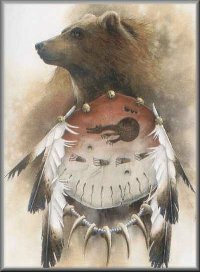 The drum is their symbol and their symbol is full of medicine, spiritual power, and the heart beat of the American Indian. Rhythm is the Law of the Universe. We see it in the movement of the waves, the swaying of the branches of trees, the rising and falling of the tides, in return of night and day, the seasons of the year, the coming and going of years, the beating of the human heart. One can almost feel Mother Earth turn on her axis. The medicine of my drum develops elation, a reckless joy; a high feeling of self regard. The medicine of my drum develops harmony, oneness of feeling and purpose. It is a gift of Nature and Religion coming straight from the Heart. All cultures fascinate me. 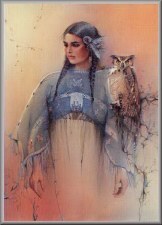 Here are some link to sites with Native American Lore and Graphics. As I find more links I will add them.